On the 23rd December 2011, Unity was released, bringing forth Holoprograms, the fully fleshed Children of Light (Holograms), and a ship that they could staff. A little over 4 years and 11 sets (including this one) later, BOOM! Grid 296, Holographic Training Facility! Hope you enjoy, and thanks for reading! In truth, there (probably) wasn’t a post like that on the 24th; I just said that for hyperbolic comedic effect. When the Children of Light were made, they were given a ship, the Olarra. 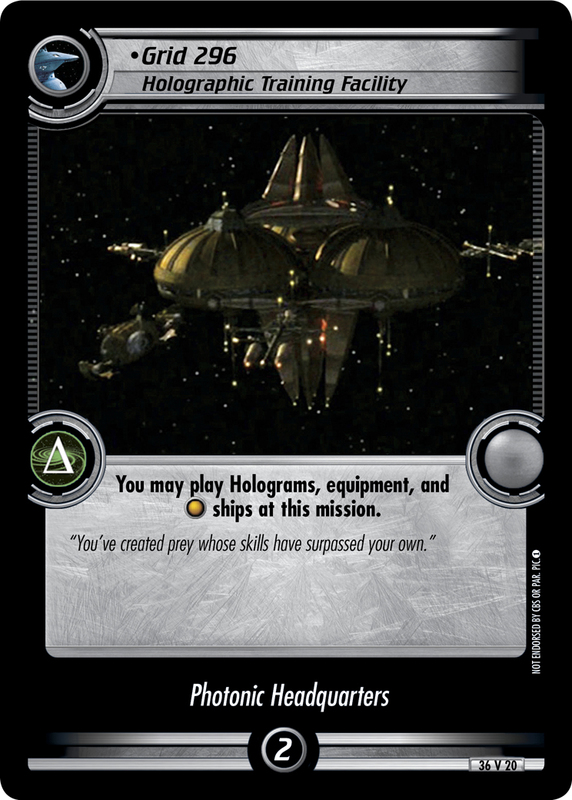 The Olarra came with game text that allowed Non-Aligned holograms to staff it, and let holograms be played to it if they could be played at the HQ. The ability to staff it – that’s great – but that ‘if’ caveat on the played part? Ugh. It was just unnecessary. Well, we were stuck with it, so numbers were run to find the best HQ for the holograms to hang at. 18 of them are Non-Aligned, so can be played at any HQ (bar the Unicomplex and the new Phase II HQs). That’s fine. The remaining 13 are Federation (1 TNG, 1 Earth, and 11 Voyager). Voyager doesn’t have and doesn’t count as an HQ, so that would make the hologram’s HQ of choice… Earth, Cradle of the Federation, right? As 7 of those 11 Voyager holograms are bastards have Treachery, they could be played to Athos IV, the Maquis HQ, making that grim little fog-bound piece of rock in the middle of nowhere the Olarra’s ideal launch pad. For years players have questioned why “ Treachery personnel” could be played at Athos IV in the first place, and more recently, since the CC are issuing their own errata now, why they haven’t got round to taking it off? Project Crichton was looking at the Maquis under the Phase-II microscope. One of the points that came up was ending the Maquis’ reliance on Treacherous Feds from all over the timeline. This could be done either by ‘carrot’ (the creation of better Maquis personnel) or ‘stick’ (the removal of that line of game text from Athos). But we realised that by stripping Athos of its access to mofos Treacherous Feds, the Holographic deck type would lose access to seven unique personnel, essentially killing if off. So, we went with the simplest, most elegant solution to that: a holographic HQ. Grid 296, Holographic Training Facility. Now, everyone’s welcome, regardless of creed, colour and affiliation – not only can you play the entire Revised Voyager crew there, but they can now mingle with your Leah Brahms, your E.M.H. Programs, and your Doctors (plus anyone else the CC creates in the future – possibly Barash’s “Future Imperfect” decoys, the rest of Bashir’s “Our Man Bashir” heroes and villains, or even Tuvok’s “Worst Case Scenario” renegade Maquis crew). It’s what Iden would’ve wanted.